It was 5:30 pm and the quiet forest seemed to have suddenly come alive. A downpour later, the howling wind violently rustled the trees. The kids in the house were running about, singing songs in Nepalese. My host was out plucking pears for all of us while his wife stood stirring curry in a steel saucer in the kitchen. For a moment, it seemed like a regular day in a Sikkimese household, until I looked out. There was neither another person nor another house in sight. The view from my small two-bedded room, done in green and red, was mostly shrouded in mist. The clouds had enveloped the mountains and I had been watching them shift and change shapes for a while. There were trees as far as I could see, in shades of green that I did not even know existed. 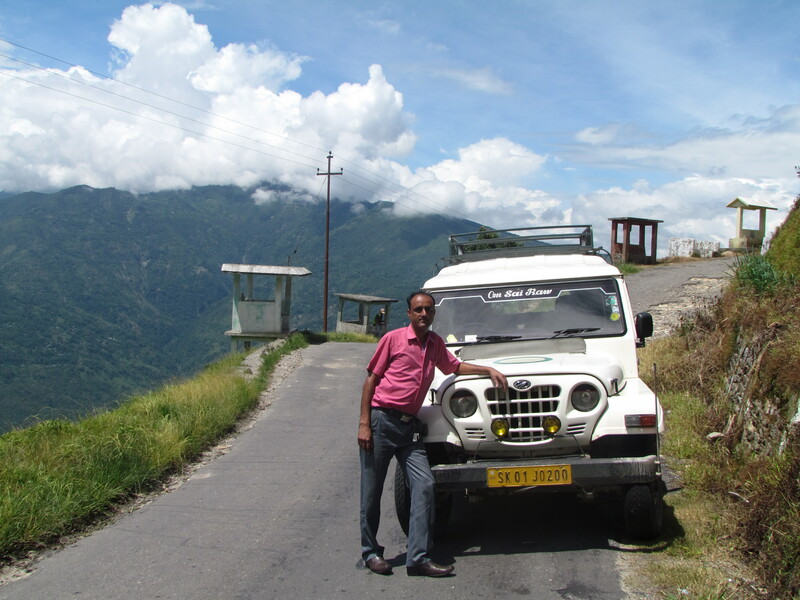 I was in Lingee Payong, a remote twin village in South-east Sikkim that lies at the base of Maenam Wildlife Sanctuary. Untraceable on the map and with very little information about it available on the internet, the village was undoubtedly the most beautiful discovery during my ten-day long Sikkim trip. A week before I was to leave for my assignment for SaffronStays, I had gotten in touch with Mr. Gitanath Koirala, the General Secretary of Comprehensive Tourism Development Committee Payong, who patiently helped me plan the trip over countless phone and email conversations. Once in East Sikkim, three nights in Gangtok and half a day in Assam Lingzey later, I finally met him in the transit town of Singtam. 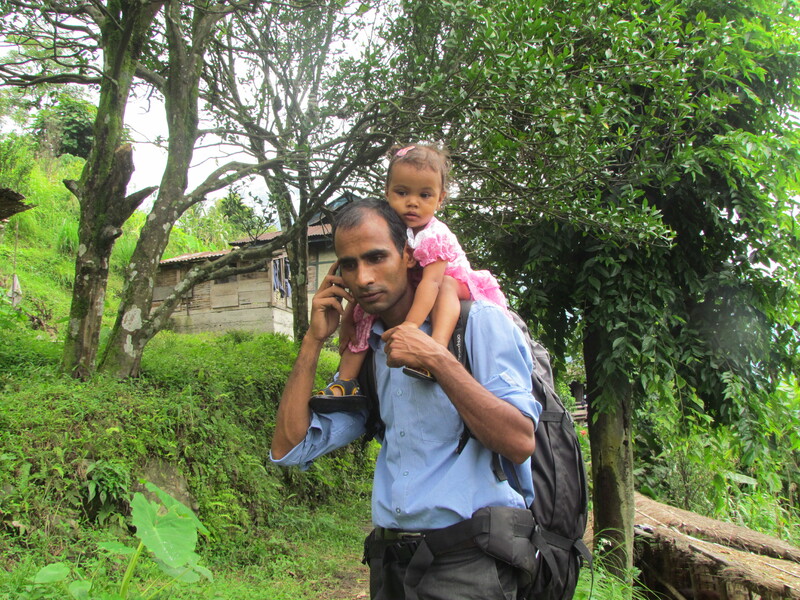 We were to travel to his village together. I shared a packed cab with his wife and two little kids for an hour until it dropped us on a deserted road. 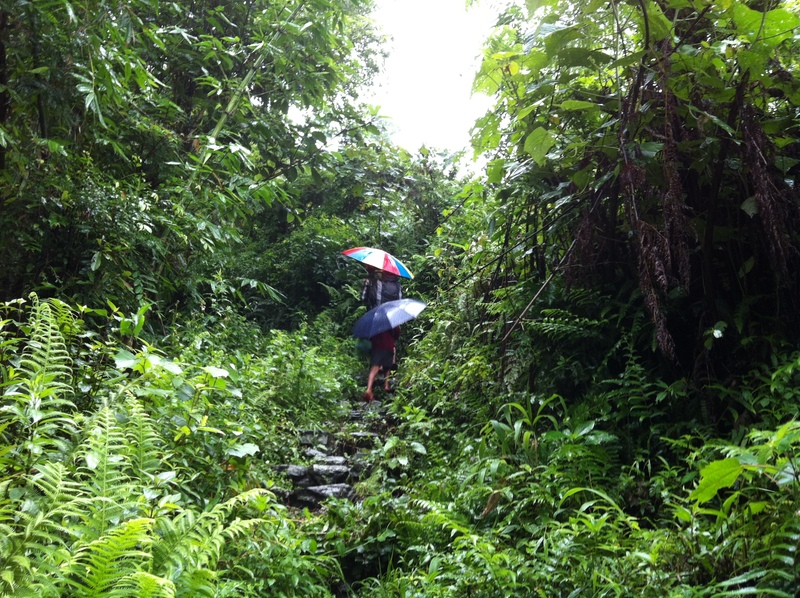 There on, with our bags carefully strapped to our shoulders, we were to trek up to Mr. Gitanath’s house, which, like all other houses in Payong, was built on a solitary slope. The 500 meter uphill trek, through dense forests at one point and through narrow trails by the edge of the hill at another, was enough to exhaust a non-trekker like me. Panting and slipping, I managed to reach Mr. Gitanath’s house after about forty-five long minutes, his two kids trotting much ahead of me. As I finally put the heavy bag down, caught my breath and looked around, I was instantly convinced that the struggle had been worth it. Away from all forms of civilization, the family lived there in a small house amidst acres of self-grown vegetable farm, orange orchards and fodder trees. The distant mountains stood at the backdrop like a protective shield. 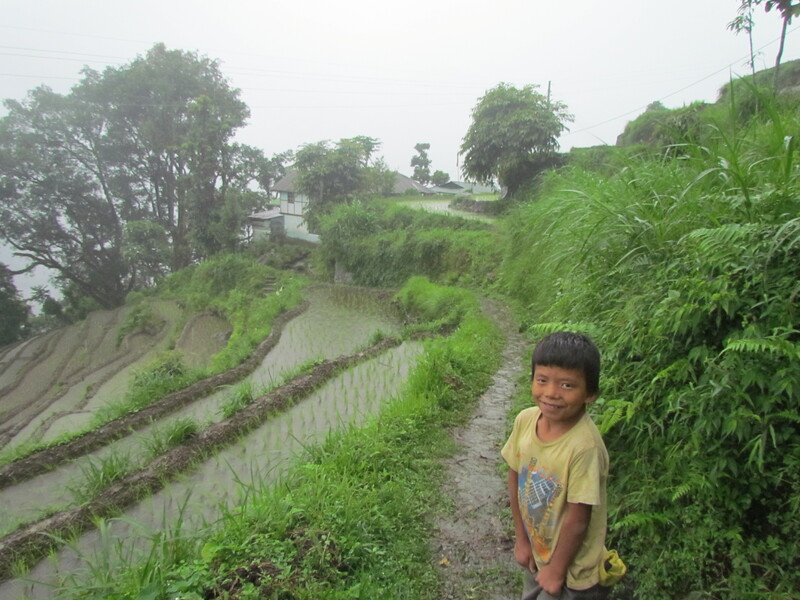 Almost all houses in Payong were built the same way and lay scattered at considerable distance from each other across the slope of a hill. This made access to outsiders very difficult, unless guided by a villager himself. The locals here enjoyed their space and solitude. Lingee, the other half of the twin-village, was quite different. It lay above Payong and could be reached by driving through a scenic forest road. All its houses, however, were located by the motorable road. Until a few years ago, Lingee Payong was a prosperous village owing to the growth and sale of large cardamom in huge quantities. Mr. Gitanath himself recalls producing 1200 kilos of it in one season. In the year 2000, however, a viral disease attacked the crop, drastically reducing its growth by 90 percent. To make up for the sudden loss of income, the locals took to cutting and selling timber – a highly unsustainable alternative. Soon, alarmed by their own desperate measures, the village gathered and formed a committee that decided to use tourism to generate income. With no knowledge as to how to do so, the committee took the first step by sending two people to North Sikkim for tourist guide training. The young guides returned, having witnessed some form of village tourism and discussed its feasibility with the rest of the locals. 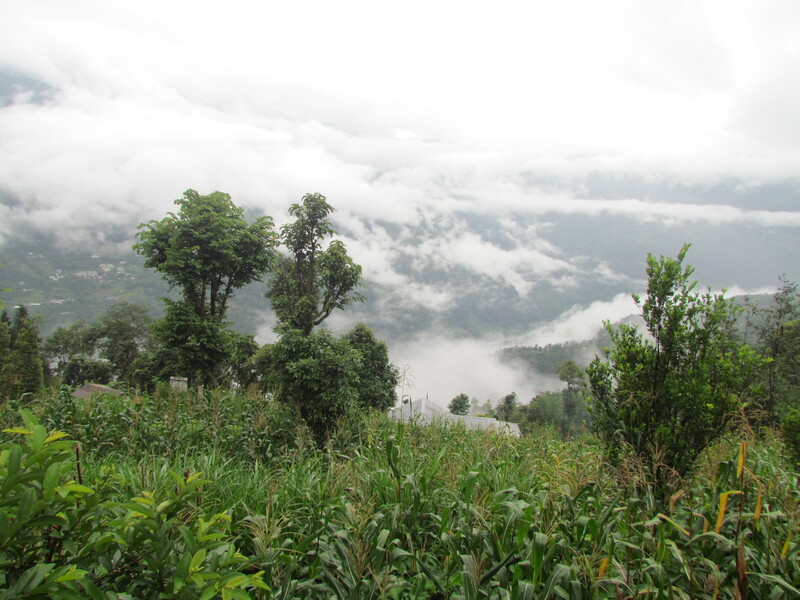 The Ecotourism and Conservation Society of Sikkim, a non-governmental organization, helped promote the twin-village and provided tourism related training to locals. A hall was built for tourism related group activities a few months later and a number of home stays have opened their doors to guests ever since. Considering the remoteness of the location, I was amazed by how ambitious the locals had been and how much they’ve achieved over the years. Mr. Gitanath went on to show me an extremely detailed five year tourism plan for the area that was mapped by a German traveler a few months ago and one that they want to implement to the minutest detail. He told me about their collaboration with Shankara Institute of Technology in Rajasthan whose students visit the village every year for one of their papers. And finally, before we sat down for a hot meal made of organic vegetables, he showed me architectural sketches, made with the help of international travellers, for home stays that will be built using the grant sanctioned by Sikkim Tourism Department in the future. 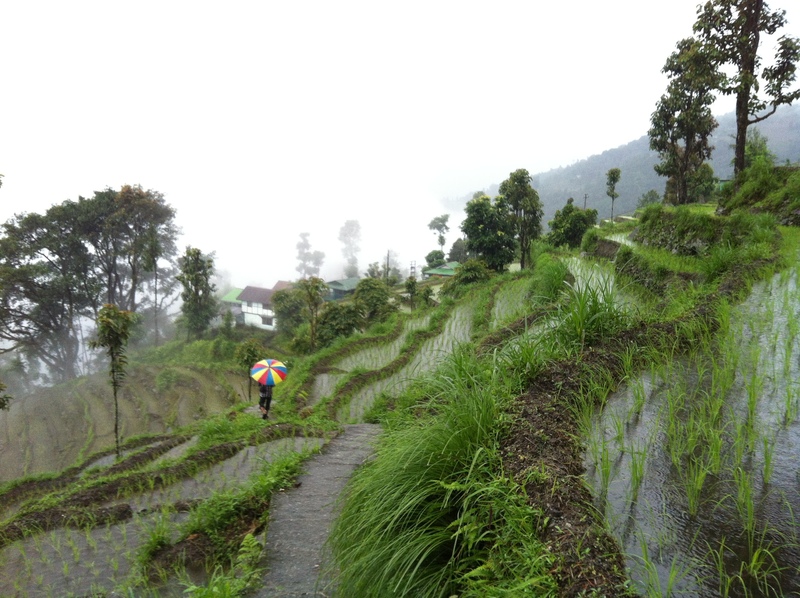 Hiking through beautiful terraced farms to reach the home stays in Payong. This little kid gives me company while I try to catch up with Mr. Gitanath. He doesn’t own a home stay himself, but as we hiked through the village the next morning, he introduced me to hosts and their homes with such zeal that I was often lost for words. Located in perfectly unspoilt locations, by the terraced farms, forests and sacred trees, these homes radiated warmth and hospitality like no other. Locals spoke to me in half-baked Hindi, offering hot tea and steamed corn cobs to keep away the cold. It wasn’t long before I stopped complaining about the pouring rain and my aching feet. It was all worth it, I reminded myself. After spending a fulfilling morning with the locals, I hesitantly sat in the car to proceed with the rest of my journey around Sikkim. But before I could leave, Mr. Gitanath let me in on a few secrets about the place. 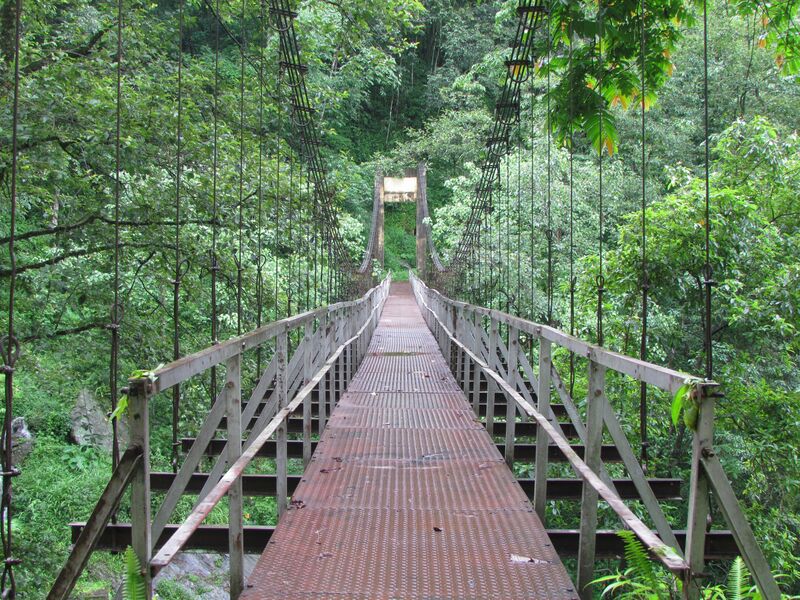 He told me about the hanging bamboo bridge at a height of 200 feet that allowed you a glimpse of a beautiful waterfall only after you had walked a certain distance. He also told me about the sacred cave that lay at a depth of about 120 feet and villagers visited it every Shivratri, with ropes and lamps, to offer prayers. He recalled the scenic camp site that he had spent chilling days in and the nights when fireflies lit up the forest around his house. His daily life was an extraordinary treat for us travellers and he was visibly excited to show it to the world. As I write this, it’s almost been a month since I spent those 24 hours in the beautiful twin village of Lingee Payong. I am counting on the lingering warmth, and the many stories, secrets and memories to take me back there again. Note: From Lingee Payong, I travelled to the rest of South and West Sikkim with Bhim. He is an excellent driver, reliable and has a good knowledge about the roads and the regions around the state. He is also very friendly and made great company during the trip. You can avail his services by calling him at +91 9733220703. One can visit and stay at one of the homestays and experience this lovely village. Click here to check and book homestay options in Lingee Payong (Sikkim).